11 June 2014. Kayapo Chiefs Raoni Metuktire and Megaron Txucarramae during their visit to London. The chiefs stand in a group with members of the British House of Commons at the Houses of Parliament in Westminster. 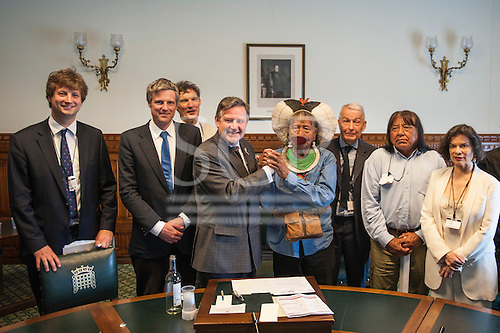 Left to right: Edward Davey (Prince's Rainforest Project), Zac Goldsmith MP, Patrick Cunningham (Tribes Alive), Barry Gardiner MP, Chief Raoni, Frank Field MP, Chief Megaron, Bianca Jagger.